Which cities are the world’s economic powerhouses, and what portion of global wealth is located in these key urban centers? Today’s chart pulls information from the latest report from market research firm New World Wealth, which we previously cited weeks ago when we visualized the shift in global wealth over the last decade. The data shown in this chart represents the total amount of private wealth held by all the individuals living in each of these cities. Figures here include all assets (property, cash, equities, business interests) less any liabilities. Meanwhile, government funds are excluded from these figures. 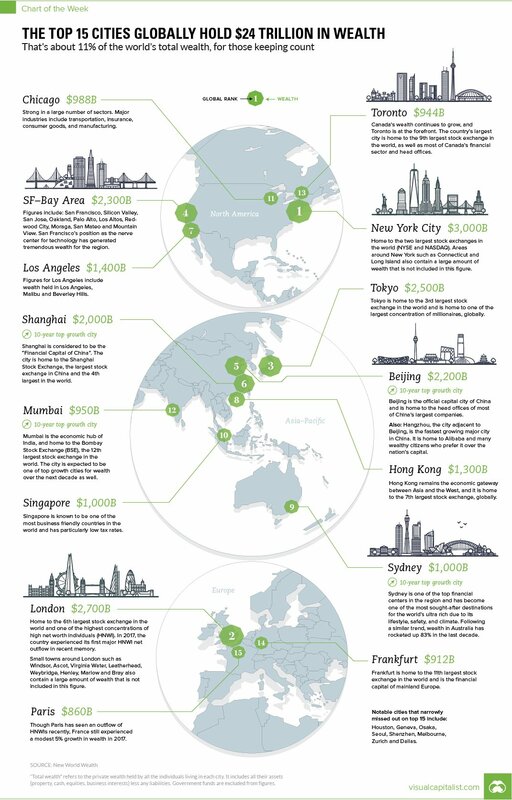 New World Wealth also mentions that there were eight cities that just missed out on the top 15: Houston, Geneva, Osaka, Seoul, Shenzhen, Melbourne, Zurich and Dallas. It should also be made clear that wealth is a different measure than Gross Domestic Product (GDP), which is another common metric used to gauge economic power. That said, we do have a list of U.S. cities by GDP size if you’d like to explore the GDP measure on a city level, as well. According to the same report, over last 10 years, the cities with the fastest growing rates of wealth were San Francisco, Beijing, Shanghai, Mumbai, and Sydney. Meanwhile, Mumbai is expected to be the city that will see the highest rate of growth over the next decade. Shenzhen: With $770 billion in wealth, this city just misses the Top 15 list. It’s considered the high tech capital of China and is home to the Shenzhen stock exchange (2nd largest in China, and 8th largest in the world). Major smartphone manufacturer Huawei is also based in the city. Hangzhou: With $425 billion in wealth, this city doesn’t quite measure up to others on the list at first glance. However, it’s actually only a 45 minute train ride away from Shanghai ($2.0 trillion) – and people that work in Shanghai often have homes here as it is considered more scenic. Hangzhou is the fastest growing major city in China (in terms of wealth growth), and ecommerce giant Alibaba notably calls the city its home, as well.